If you’re like me, when you get a whiff of warm weather—even if today, it’s only the faintest whiff—your mind turns to summer and the sweet memories of summers past. Six years ago I had the pleasure of cooking for a gaggle of campers in the Sonoma redwoods about ninety miles north of San Francisco. 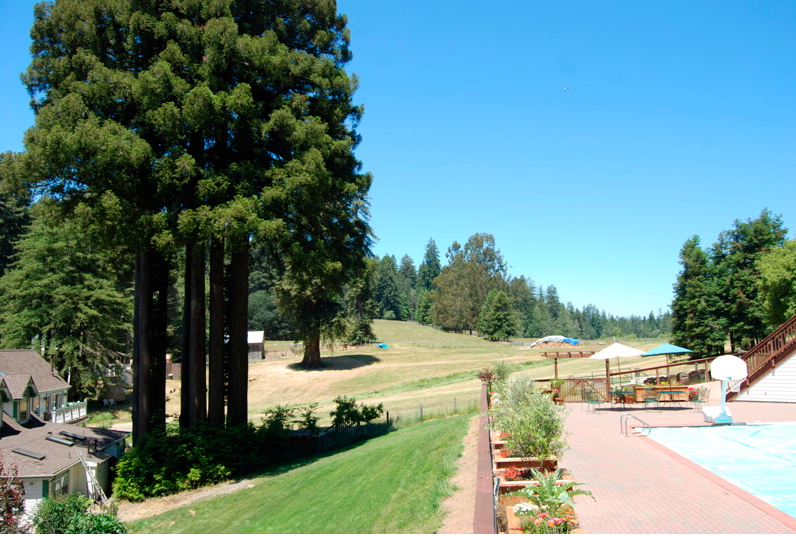 Plantation Farm Camp is located in Cazadero, CA, just a few miles from the Pacific and off the Highway 1. The campers live outside all summer and help run this working farm — feeding animals and gardening, with plenty of time for swimming and tie-dying t-shirts. The staff also live outside, in tents, and on more than one occasion I tucked into my sleeping bag to find a lizard squatting in there. I loved living and working here. The natural beauty of the environs inspired introspection, and the bounty of the farm inspired dishes like lamb scented with fresh-picked lavender. This dish here, while not exactly inspired by the local or seasonal bounty of Sonoma County, became a staple dessert that summer. Many of the campers could not eat dairy and we devised this dairy-free, egg-free chocolate cake that is so moist and luscious, you do not miss what’s missing. Elise, our kitchen manager, said the secret was in the unlikely ingredient of white vinegar. 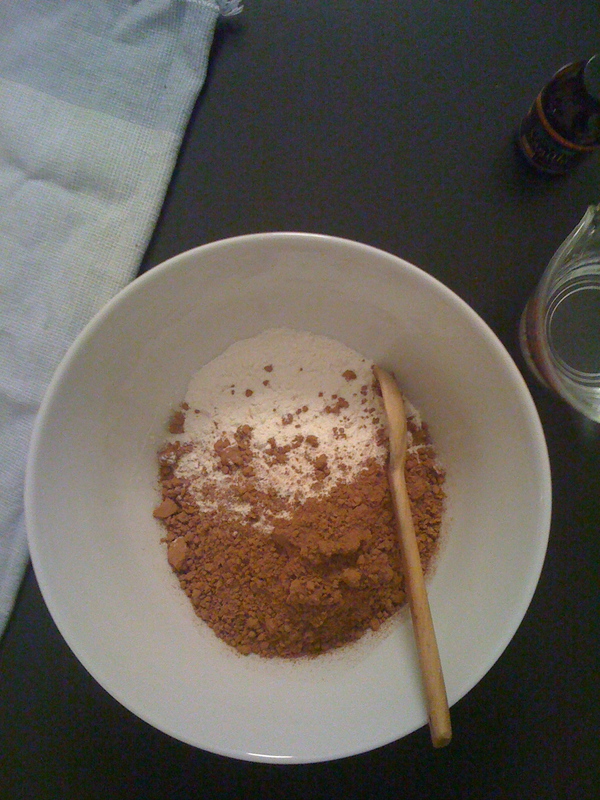 In a separate bowl, mix the wet ingredients, then add to the dry mixture, mixing as little as possible while still removing the lumps. Pour the batter into a greased pan, such as two 8″ round cake pans, a bundt pan, or rectangular pan. Baking times will vary depending on the type of dish you use. About 30 minutes for the 8″, a little more for a bundt. For a variation, you could try adding spices like chili powder, cinnamon, nutmeg, or ground clove. For a mocha cake use strong-brewed coffee in place of some of the water. Blend the room-temperature margarine with a spoon until soft, then add the dry ingredients, followed by the wet. For variation you could add mashed banana, cream cheese, or coffee to the frosting.